'Patriots Day': A Painful, Painstaking Depiction Of The Boston Marathon Bombing The third collaboration between director Peter Berg and actor Mark Wahlberg offers a detail-rich and nuanced examination of the 2013 bombing and its chaotic aftermath. Mark Wahlberg in Peter Berg's Patriots Day. 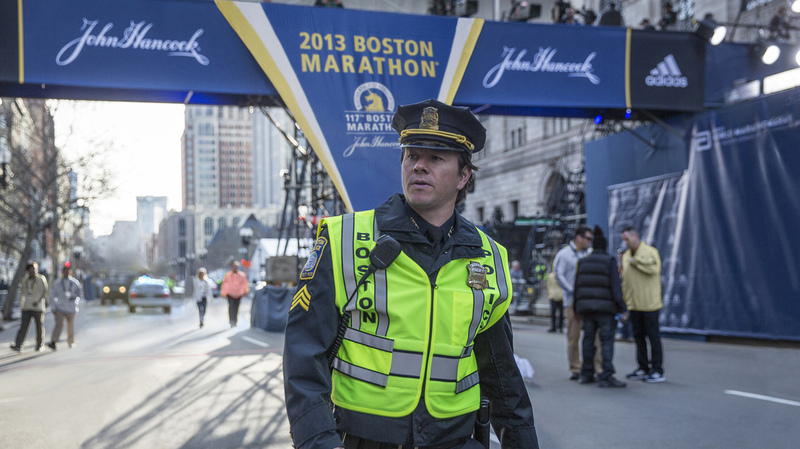 This time, Wahlberg plays Boston Police Sergeant Tommy Saunders, a detective who, as a final act of penance for some never-explicated transgression that got him suspended, happens to be posted in uniform ("the clown suit," he calls it) at the finish line when the two bombs go off. (Berg shot some scenes at the 2016 Boston Marathon, though not his reenactment of the bombings, obviously.) Somehow every cop in the city, including the commissioner of police himself, knows Tommy well enough to call out his name when they see him, but there's no reason why you should remember it: Unlike the people played by the other A-listers in the film's sprawling cast, Saunders is fictitious. He's no crack-shot Hollywood super-cop, though, just a dedicated and very tired flatfoot with a bad knee. (He spends the movie limping and begging E.R. nurses for Tylenol.) Middle age has dulled former Calvin Klein poster boy Wahlberg's looks just enough to let us buy him in this sort of everyman role. Saunders is genuinely shaken by the horror he witnesses — the bombing killed three people and injured more than 250 — and Wahlberg makes you believe it. Dropping in a made-up character to witness key events in the investigation, Forrest Gump-style, is a risky move, but one that allows Berg and his co-screenwriters Matt Cook and Joshua Zetumer to avoid potentially more damaging storyscaping elsewhere. Though its efforts to keep Saunders in the mix occasionally become comical — in one scene, the FBI calls him in from home to get information they could've obtained by looking at a map — Patriots Day otherwise sticks close to the facts of the case, complicated and random though they are. There are an inconvenient number of supporting characters. It's the sort of movie where the exact time and the number of hours elapsed since the bombing frequently appear in the bottom left corner of the frame, while another aerial shot of the skyline reminds us that the effects of the investigation are rippling out citywide. Jeffrey Pugliese, the Watertown Police sergeant played by J.K. Simmons, is a real person, instrumental in the capture of chief bomber Tamerlan Tsarnaev (Themo Melikidze). So is FBI Special Agent Richard DesLauriers, played by Kevin Bacon, and Boston Police commissioner Ed Davis, embodied by the John Goodman. (This is the rare movie where Goodman does not dominate every scene he's in.) Although the actors playing them are less famous, Jessica Kensky and Patrick Downes, a young husband and wife who between them lost three legs to injuries sustained in the bombing, are real, too. As with so many other well-made recent films about real people — Sully, Hidden Figures — Patriots Day caps off its reenactment with a coda featuring the people whose lives it has fictionalized, all musing on how the tragedy brought out the best in Boston. While it's natural to be suspicious of these kinds of feel-good homilies, they're balanced out by Berg's persuasive depiction of the chaos of the investigation: residents ordered to remain in their homes, the FBI forced by a FOX News leak to release photos of the suspects to the public despite fears it would jeopardize the investigation and lead to attacks on innocent Muslims, poor coordination among law enforcement agencies. The movie's one big action set piece, a shootout between police and the Tasarnaev brothers in a residential neighborhood in Watertown, just west of Boston, is appropriately frightening and disorienting. Berg has occasionally been accused of jingoism. The Kingdom, his 2007 action thriller about about FBI agents investigating the bombing of an American oil company's housing complex in Saudi Arabia, beat the war drums hard. He shows more delicacy here. In the movie's most chilling scene, the American wife of dead suspect Tamerlan Tsarnaev — played by Melissa Benoist, TV's Supergirl no less — is explicitly denied access to an attorney and interrogated by a Muslim woman from an unnamed agency while even DesLauriers, Bacon's G-Man, stands by, agape. It's the way that Berg is alive to the tension and moral murk of scenes like this that elevates Patriots Day to something slightly better than just a sharply executed procedural. It isn't quite Captain Phillips or Zero Dark Thirty, but it's a more thoughtful and restrained film than you might've been expecting.